Do you work for Zoho Mail? *Secure email hosting for your business* Email@yourdomain.com Get a custom domain email for your business. Create unique and professional email addresses for your employees with your company domain. Secure, ad-free email with 99.9% uptime guaranteed Zoho Mail guarantees you the most wanted availability with the utmost security and privacy to your account via EAR, TLS and TFA authentication. Seamless email migration Make your switch simple using our Migration tools. Our expert 24x7 technical support will help you make a smooth transition to Zoho Mail. Control Panel Manage your business emails from Zoho Mail’s powerful Control Panel. Admins can set up individual mailbox quotas and privileges, Easy Migration Migration to Zoho hosted mail is a breeze. You can have our ever-ready support experts walk you through the process or download the self-migration tool. MS Exchange PST based transitions are especially a zap! A newer way to email Zoho Mail has brought the best elements of social into email, letting you tag people or share folders in a click. Streams will let you get social, and help you spend more time outside the (in)box. Instant Chat This built-in instant chat allows your corporate community to quickly come together to discuss important topics and make decisions faster. Best of all, it runs entirely on your browser as a non-distracting sleek bar at the bottom. Calendar, Tasks & Notes Your corporate users can keep track of important tasks, share calendars, take notes, et al making collaboration smooth & effective. Your users are desktop savvy? No worries. Syncing is seamless with popular desktop clients. Multiple Email Accounts Why not have you access all your other favorite email accounts from one place? You can configure other POP accounts in Zoho Mail, each of them displayed as an exclusive module with a single click. Isn't that actually cool? Learning about Zoho Mail? We can help. Zoho Mail can bring many benefits. This e-mail box, provides fast, reliable use and most importantly without advertising. You can use it wherever there is access to the browser or applications on your phone. It offers an office package, we have a network drive on which you can put any documents, archives or photos. In addition, we are able to create, change and collaborate with content editors, spreadsheets and archive input tools using the latest modern web editors. The big advantage is the eye-catching graphical interface, easy to use. Zoho Mail also offers POP3 and SMTP configurations, synchronization with applications such as Documents, Calendar, Notes, etc. Additionally, a two-step verification option is required. One of the drawbacks we can experience when using this mailbox sometimes there is a problem with configuration. Sometimes it also happens that the messages we need are treated as spam. It will be an ideal solution for people who care about safety and speed of action. It is compatible with many valuable applications. The company appreciates the incredible time benefits, we can have all the necessary files in one place. We are also able to maintain a strategic distance from senseless spam, which is regularly mixed with the use of spam. Employees can communicate effectively with each other, appreciating the created chat function. "Zoho Mail - My review"
Zoho mail is a free e-mail solution. As befits a modern mailbox, Zoho Mail offers tools (e. g. extended folders, message marking, filters) that allow you to organize the mailbox. In the case of a free account, the user has 5 GB of space available on the mailbox plus an additional 5 GB for documents. The latter space is added because Zoho is primarily an office suite supplier with a range of different and decent applications for creating documents, spreadsheets, and presentations. The last element, although extremely important, is privacy. Zoho emphasizes that it makes every effort to ensure that unauthorized persons, including Company employees can not suspect mail. Scanning programs for useful content for advertisers also do not have access to it, which means that there are no advertisements in the free or paid version. When using Zoho Mail, I did not notice any significant drawbacks except for problems with the anti-spam filter. If you are looking for a mailbox that will allow you to integrate with your Google Account and add your domain, you should consider choosing ZohoMail. Thanks to using Zoho Mail I save a lot of money on buying paid competitive solutions. "A different way to use email, at this time." Zoho is an incredible e-mail platform, with a distribution of the inbox with different characteristics, which provide more adequate information of the mails received, categorizing this type of messages in different folders, which allows you to find more easily the emails that are received daily, since not all go to the same folder, the interface of this application is fantastic, it is clean and they do not have any type of publicity, the distribution of the board is impeccable, it is a very different mail to the ones normally used, although it has a monthly cost, it is worth every cent to pay it, besides in Zoho not only gives you the mail but many additional tools for the same price. I feel that the interface on the smart phone can improve a lot, I want to see exactly what I see in the browser, I really like this email, but in the browser, in the application I feel that many features are lost, and I can not find what I need so easy as in the computer, I think you can improve a lot in this, if you could get the same web version in an application would be something fantastic, it may be something difficult to achieve, but not impossible. A fantastic email, when you start using it you will notice, that the emails, that you normally use, do not have even half the features that Zoho mail gives you. It is very easy to use as you can install it's version of the mobile app. That way, you are always informed of any emails even when you are on the move. I have also found Zoho mail to be very useful as I was able to link all my emails to it and view alll my emails under one inbox. Zoho mail also has an auto reply feature whereby whenever I am out of the office or am not in a position to access my mail, anyone who sends an email is replied to immediately with a message that I have preset either telling them that am out of the office or notifying them of who they can get in touch with if it's an urgent matter. The size of the files that you can attach is limited to 20mb. I found that to be a very limiting feature. Zoho mail is used in our office for official communications and sending of files or documents. I like that you can easily get a free email account through Zoho that is linked to your own domain. I have this set up for my side business where I make crafts. The only thing that can be a little tricky is setting it up, if you aren't very tech savvy. I'm pretty good with this kind of thing and it took me a little while to get it going. If you're persistent and read all the instructions they provide you with, you'll be fine. I would say, definitely go for it. It's free, which is great, and not too hard to set up (all things considered). Zoho allows me to have a professional email with my domain name attached, free of charge. This really helps me out because I own a (very) small handmade business. I love being able to reap this benefit without having to pay for it. "The whole company emailing system under one single panel, and that's Zoho mail." Zoho whole system is made especially to manage a company's workflow and efficiency. And one of the most important requirement of any company now a days is it's own Email. So, Zoho mail is perfect choice to have own named email either it's the domain name in case of website or a company itself. In our organisation the employees have been assigned their company emails as well using Zoho Mail. The Zoho mail can be accessible through desktop or mobile application, both have great UI design and convenient options to maintain and manage all our mails. Either it's personal or company or any other kind of mail, you always have an option to create a separate folder for every kind of mails. Rest all required features are there that a normal mailing system usually has from from drafts, spam, trash to groups, folders, marking emails important, etc. All of these features bundled in one single portal. There is also no page reloading while accessing any option inside Zoho mail panel on desktop which gives you a feel of using desktop App . In addition, Zoho mail panel also provide an interesting feature of Workplace Apps. In this you can download many useful apps as per your company requirement like a calendar to mark important dates, a chat system to communicate with employees, a task app itself, and many more. So overall, Zoho mail is without any doubt a perfect choice to manage and maintain company emailing system. I am using Zoho mail from a very long time, as of now I don't face any problem with this. So no dislikes. Use Zoho mail if you are working with large employee team and everyone will have own email. 1. Have own company mail. 2. All employees are assigned with their own email. 3. Helping to manage all mails according to it's type using folder based feature of Zoho mail. 4. All social email are automatically assigned to newsletter folder which keeps official mails separate from social mails, that's a nice feature though. 5. The navigation panel is very cool and convenient with all required options available. "A complete mail service to work with." I do not like Zoho Mail, which, unlike other email service providers, does not allow you to completely customize its appearance, just change the color to a few ones. Well as I clarified previously, Zoho allows us to minimize the time of communications between colleagues, all this thanks to its chat system. It also allows us to organize as a team thanks to its task and calendar tool. "Zoho Mail - My favorite mail hosting"
What I like almost Zoho mail is that it is an excellent elective to conventional mail suppliers, it offers you a benefit without any exposure which is exceptionally much acknowledged, you have got the alternative to open an individual e-mail with Zoho or in the event that you incline toward an e-mail trade at exceptionally competitive costs, Zoho interface seems very clean and useful, you'll be able to adjust it from the arrangement, which has numerous choices to change and customize your mail, has exceptionally commonsense modes of notices because it bunches you emails devices concurring to the arrange of priority given to them, so that they are requested and prepared for the corresponding reading Zoho Mail is compatible with mobile devices and computers. The only drawback I noticed when using Zoho Mail is that I cannot edit the profile photo for my email account. If you are looking for a solution that will enable you to use your domain for mail, you should consider trying Zoho Mail. Thanks to using Zoho Mail in a comfortable way I can browse e-mails and send e-mails. "Easy solution for small business owners"
I like that zoho mail incorporates the calendar feature within the mail app so it’s easy to handle all appointments and meetings while reading emails. The app is simple and easy to use, as well as design customizable. I also like that zoho mail creates separate tabs for unread emails so you can see only what needs to be opened, and then the option gives see everything all together. I also like that as well as having a “flag” feature you can set reminders to read any email at another time. Sometimes you read emails and need to take action, but don’t have the time at that moment so it’s nice that you can either mark it as unread or just set a reminder to open it again and take action at a later time. I dislike the notification sounds zoho has available. Getting an email should be a positive experience and unfortunately the sounds are all not that exciting. I wish there were more options so I could enjoy my notifications. "My favourite mail app for business - and I'm picky!" I'm a nut when it comes to creating rules to manage the hundreds of emails I get on a daily basis, sorting them into folders, prioritizing emails that come in from clients, and marking mundane emails as already read. With other platforms it is difficult to find a solution that doesn't degrade after a certain number of rules. I have over 100 rules already and Zoho Mail keeps up with me 100%! I also like that it integrates directly with Zoho CRM, so I can access every email to and from a client right from within Zoho CRM, and I can look up CRM records directly within Zoho Mail when I'm reading a client email! I was originally using Polymail (because I'm on a Mac), and even though I switched, I still really miss the per-recipient read and click tracking. Zoho Mail could probably earn lots of extra business simply by amplifying the controls and features users have access to when monitoring when emails are opened and links are clicked. Polymail had this down 100%. I'd give Zoho Mail an 80% on this. If you're a small business owner that has endless amounts of time on their hands to waste spinning your wheels then this product is not for you! If you value apps that make your life easier and integrate seamlessly with other apps in you workflow then Zoho Mail is absolutely worth a try! Integration is a huge plus for me. I'm cutting down on wasted time I used to spend duplicating my work in multiple places simply because my apps didn't automatically communicate with each other. This mail service can be used on personal and enterprise tier, i've tried to set up my website's own mail service, for the first time i was overwhelmed by the amount of options that Zoho gives you, trying just the free version to taste their service, what i liked the most was the wizard, helpfull at 100% if you didn't know how to set up MX- records, or what they are, also, their help section is very good, consice, to the point and with pictures to help you out set up this, even though there are a lot options with zoho i think is a very good tool as a free option to personal or small business, once you've reached the set up the use of your mail and log in and giving others their account is not that hard, i'm still learning about it and hopefully to make another review soon with the premium option. I´ve made a mistake in the configuration and had to delete everything and start all over because the wizard couldn't finish the set up, this was my fault but i think the wizard should be a little more friendly when you don't finish the set up, like sending you an email with a link to finish the wizard and don't get lost in the procces like me. I sugest to pay atention to the wizard and the first configuration to your mx records so you don't get lost like i did, don't be afraid it's actually more easy than others that we've tested. Our web host didn't provide us with mail option, so we´re testing the free tier from Zoho to see if works for us and upgrade if neccesary. "A simple free email client that works great for my small business." Zoho Mail has been huge for my small team. We have a team of 5 people that have business accounts with my company. It allows us legitimize our business with clients as zero cost. There are paid plans but this works for free for up to 25 emails with a single domain. We also use Zoho mail to set up new email for clients that we work with. We have had nearly zero down town as well. There is not much I dislike but I do wish the control panel was easier to access and understand. There are lot of options but you need to have so technical savvy to navigate it properly. Set up takes some work as well. You have to have a good understanding of who your domain provider is and how to push email to that server. There are walkthroughs for this, but it really is intimidating if you are new to server side set up with a website or any online domain provided. Get the free account and see if it is the right service for you. We needed a solution for our team to be legitimate and be low cost. This helps with both. The fact that we still have room to add more emails under the same domain is amazing. "My review on the Zoho Mail services"
What I suggest for improvement for Zoho Mail is in the mobile app (Android version) that should render emails more mobile-friendly. Some emails showing with small characters, as if I am viewing on a desktop. Also I would like to see more APIs and integration features for other 3rd party apps, notably Slack and Google services. A simple, inexpensive point-of-entry with very fast implementation and roll-out. Zoho Mail delivers. Zoho Mail offers generous packages for startups, that won't require a single cent to set up and use. 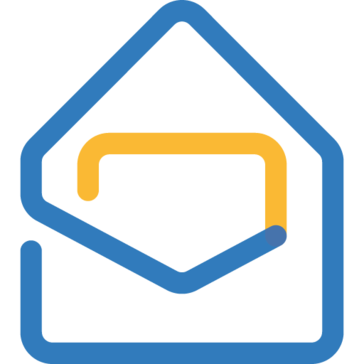 "Zohomail offers something of a good alternative for a mail server"
Zohomail is a mail service I started using to stay away from spam emails. It offers greater protection against fake and phishing emails. It's very simple to use. The mail service offer a direct straight presentation and you can also link it to your professional work email. As you enter the interface, it seems as if Zohomail tries to suggest many other options or services to use. Some of their services are paid ones but I don't think it's a great business model in ever competitive world including the likes of gmail. In case you are looking for a very discreet and easy to use mail software for sensitive information, Zohomail is the way to go. I use Zohomail as a proxy for my newsletter. Every response I get on my newsletter is stored in Zohomail. Secondly Zohomail is my first option for sensitive operations. "Zoho Mail, the best email solutions ever"
It is user friendly and very easy to set up or even migrate. Offers the ability to enable or disable pop and imap. Has numerous modules such as group calendars, streams and tasks that allows users to communicate and share documents easily. No problem I have found when using Zoho Mail. It is definitely one of the best out there. We have been able to streamline our mailing processes and now users can communicate easily. It has also allowed us to cut overhead costs due to its affordable nature. A clean, fast Webmail with features matching or superior to those found in desktop email clients. It never display ads, even in their free plans. It's very easy to familiarize like my senior manager introduce me to zoho it just take about five minutes to get it going. Specially setting up an email for a specified domain. Sometimes when accessing the web mail, it takes time to load, it's a minimal issue, also if they could have a low bandwidth version of their web mail, its a sure win. I am highly recommending Zoho mail for mail web hosting, it's not your ordinary inbox web mail it is much more. I would be glad to tell the nice things of zoho regarding productivity and their ingenuity for making web mail a breeze. "Amazing mail service for using all premium mail features with Private SMTP server." 1. UI and Design - I am really liking the UI and Design for the new Zoho UI. We are team of 23 people and zoho suits us seamlessly . 2. Security - 2F and DMARC are one of few good features to use. I really like the mail delete feature as well. 3. Pricing - Inexpensive pricing is cherry on pie. 1. Adding more than five domains in free account might be good idea as well. 2. Giving auto tags can be a good idea as well. 1. Setup all tags for mailing including DMARC and MailExchange records. This will help in more security and support from SEO side. Scalability and Simplicity . We love the design and easy switch to higher mail account . Admin Part is something very good. "You can get free domain mapping to a zoho mail account, but it's difficult"
I use zoho docs for a lot of stuff already, which is why I tried Zoho Mail. Well, I wouldn't normally use it very much, as I like my personal gmail account very much. However, when I got my wordpress.com website going with a custom domain, I wanted to get an email address with that domain attached. However, if you go through gmail you have to pay for that. I finally found out that Zoho Mail allows this. However, it was very difficult. I don't even remember how i did it. Nevertheless, my Mail.app client sends and receives mail with my custom domain email address, and somehow it is working through zoho mail. it was super hard to figure out that domain mapping email address. I don't even know how i did it anymore. "The best free mail service"
Zoho's online software suite contains a great set of tools that allow businesses to collaborate easily. My favorite part about Zoho Mail is the ability to use a custom domain name for your email address. Zoho Mail is great, but some of the software included in their suite could use some work. For example, the document editor is not quite as polished as some alternatives like Google Docs. Zoho offers two-factor authentication with Google Authenticator. I absolutely recommend using this if you only use webmail, but if you primarily access your email via a native client, you have to add the client as an exception, which did not always work for me. Zoho mail allows me to organize a company email system with ease. Free accounts can register up to five connected addresses for their organization, each of which has the full capabilities of a paid account. "Zoho: Best business email service provider"
So far, my experience with Zoho has been awesome due to its advance mailing features. Design of Zoho email is very simple as any new user can easily use it without any prior training. In recent time, I have also tried other business email platform but Zoho is my favorite due to its multiple features and uniqueness. For being an online marketer I had to keep track of various kind of detail and Zoho helped by providing inbuilt Notes and task feature where I can make the notes and create the task. With its' Task Feature, I can easily memorize the meeting, targets and general work as its gives notification from time to time. Another thing that I liked very much is speed, Zoho mail service is very fast as compared to another one. So far I got every email on the time without any kind of delay. It also allows us to change the template in case we don't like it. Here, we can also create a group email if a particular team is working on the same project. I didn't find anything to point out but there is always an opportunity to improve. But there is one issue which i have faced most of the time is the memory. Most of the time I got a popup which is showing that you have exhausted memory limited but in actuality, I did not. That is the only problem which I have faced so far! No matter its a small or a huge organization, Zoho mail is perfect from point of views. Zoho mail can really help you by making your business look more perfect by providing you with the best business email platform. It offers you the fast email services where you can interact with your clients very well. In overall if your organization has more than 10 employees then you can consider it otherwise stay on the same. 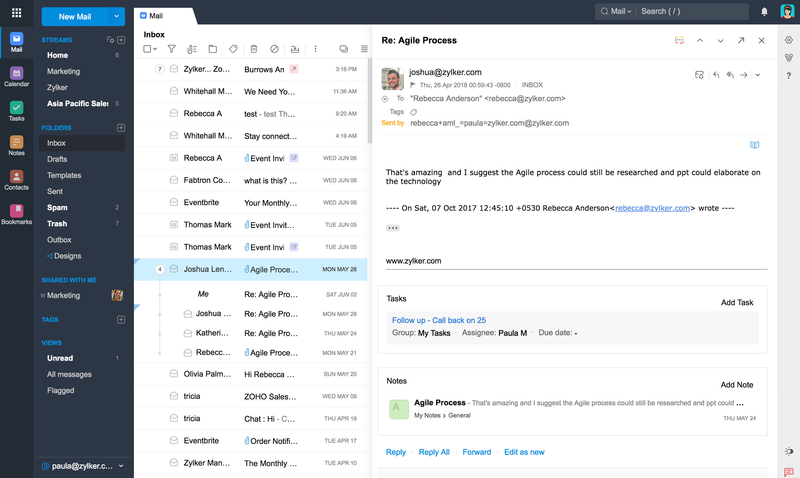 "Work in progress, still has miles to go before it matches Microsoft Outlook and Gmail"
Zoho mail is great for start-ups and SMBs with less than 10 employees. It's relatively easy to get it up and running without the need of outside help. However, the reliability of Zoho mail leaves a bad taste in the mouth. There have been instances when I was certain that our emails have landed in the spam folder when sending out calendar invites to folks from other companies. The calendar integration is abysmal and there are no third party integrations out of the box. Although the basic email features are good, advanced features such as Filters need a bit of work. Business communication and productivity, Simple email service that provides basic email capabilities for a start-up or a small/medium sized business. "The Best Email Platform for Every Big & Small Business." Zoho mail is very easy to use and easy to manage my customers through mail. It gives me alot features for mailing purposes. with the help of zoho i can easily schedules my email for targeting my clients. i think this the best feature i have seen in zoho. zoho can easily integrate with your business website. Best & fast Source according to me is zoho. I think there is nothing dislike about. Because my requirement is fulfilled over here. Zoho mail helps me to get better my email communications just because of earlier i used shared hosting and i got spamming problem with my emails. After using zoho mail i got better results and even my mail not junked to my clients which helps me alot to communicate better way according to me this major problem i solved with zoho. "ZoHO = Zero customer service"
Works like your typical hosted email service, very configurable, easy to set up and get going. Works fine till something does not. Poor support. We're having a problem receiving emails sent to email accounts hosted on ZoHo from a particular domain that worked fine till about a month ago. We can receive emails from this particular domain on other email accounts hosted by other email services (like gmail for example). Opened a support ticket with ZoHo Mail, no response after 4 days, called support - got no answer was on phone for 30 min system would say "you are caller number 1" but I did not believe that after waiting 30 min unless they only have one agent on phone support. Make sure it works for you before you buy in. Check first that you can get the support that you need. We just went based on on-line reviews and it appeared to be well supported and looks like it met our needs. We should have researched more before committing to this service offering from ZoHo. So far the problem we are having with ZoHo Mail has not been solved. "The best email for a small business!" Setting up is very easy. You need not have deep technical knowledge for setting up and also because of the excellent documentation. The fact that Zoho charges absolutely nothing to set up a quick email is simply amazing. Couldn't have asked for more. Easily the most powerful and simple email provider. When the platform has covered everything there is very little that you can find missing. However, there can be improvements on the mobile app front. Apart from that, there is absolutely nothing that needs improvement. Try Zoho mail and I am pretty much that you would stick with it. Inexpensive easily set up email on your domain. Accessing emails on mobile and web on the go with dedicated applications. "The best email platform in the market"
Easy to configure with your own domain, safety and security technology built in, you can collaborate with your team in the free version or paid version. Notes, calendar, tasks, contacts, bookmarks, private messages, the option to add a Domain Disclaimer is another Plus for me, a custom Login URL for the organization is a nice feature as well, Groups and a Password policy makes it even more robust, I'm in love with this application, thanks Zoho. In the new accounts you cannot use some features in the free version like Active Sync and IMAP, still an awesome application. Don't think about it, Zoho Mail is just the tip of the Iceberg, what I like the most is the support team, they always answer even a simple question, I'm a new user for this software and at the beginning was having questions about setting with my webhosting, they answer promptly, that is my experience with them. For me having an All in One application is a big Plus, I can manage my contacts, calendar, mail campaigns and easily access all this features from my mobile phone. "Great Communication For Small Businesses"
Zoho's email platform gives me confidence to appear professional to my clients. I can update my signature with images, add delayed sending incase I make an error, and there is free access under a certain storage size. While I try to stay under the storage limit to maintain a free account, the communication stops receiving and sending emails. You'll either franticly spend 30 minutes deleting old emails or bite the bullet and upgrade to their paid version. I have been able to communicate with clients more professionally. There are more pluggins for calendar, tasks, CRM, etc., but I do not need to use those at this time. It will be nice, once we grow bigger, to have those resources at my fingertips. "The best email client for small business"
Ease of use and a number of other Zoho apps that integrate into the mail client. Free version customer service was a bit annoying as it seems you dont get such personal service. Overall still good, just not as fast. But Hey! Its free! At least try it for a month! I think you will find that it may work for your business platform. Providing my employees with a top of the end mail client that integrates into everything else makes everyone's work easier and more efficient. The benefits are really just the ease of use of Zoho mail. It competes with Googlemail suite for business but I think its better. "Zoho best for business mail"
Zoho mail is the best emailing solution for from small scale industry to full fledge organizations. Helped us in dealing with clients in more professional way. Tool also helped us by providing inbuilt note making facility where we can create some important notes for future use. We can also schedule email to specific clients. speed is good as there is no delay in sending or receiving emails. Zoho helped us in dealing with client in a more professional way. Best business email solution for every organization. increase ROI by approaching new clients and retargeting old clients. Easy to use and best way to interact with clients and colleagues. It's free. Syncs with a mobile app. And since I use Zoho CRM it integrates nicely so that all incoming/outgoing email messages are linked to my contacts making it easy to see what and when I've communicated with them last. The free plan doesn't allow for gmail calendar integration so if you're trying to use one of the online calendar booking/appointment apps you have to go with a paid plan but the paid plans are very nominal. And for a reason that no one has ever been able to explain to me, my outgoing messages were blocked 3 times over the course of 4 months as a spammer which was and never will be the case. In each instance it's taken 24 hours for their team to try to figure out what happened and restore my email. It's great as a free version, going to be switching to a paid version so I can use my gmail calendar to sync with my zoho calendar. The one feature that is missing is your newest emails are always at the top in reverse chronology and you can change it under the new version. You can switch back to the old version and have your email sort with the oldest at the top. To me, I like to deal with the oldest emails first and work my way down so it's always a bit confusing in their default order. Email from my team, mobile email, email that links with my CRM. I really do like how this emails works and fits well to small business. This email deliveries a good package things and you also can use it with your own domain for free. this helps too much. As I just started my own company and I am managing the most of the companies email account I would rellay appreciate to have multiaccount at the same time i am online. its unpratical to logout and login to another account everytime i need to check if I had new e-mail or do something. But the app for iphone works pretty fine because I can do multilogin. i love so much the scheduled inside the email. really. it helps a lot. i do love having my email with my domain for free. this gives credibility to my business that i just started. "Outstanding tool for large quantities of mail"
The features that you receive for their pricing is really amazing. The service itself is affordable and not hard to set up. The control panel is also very convenient and easy-to-use. Simply put - it is a great product worth investing to. I have been think quite hard about this, but there is honestly nothing that I can complain about regarding this service. It has been a smooth ride for me without any issues. I would say go for it. Since they have money-back guarantee policy, you will be able to test our their services first before deciding to commit fully. I started to encounter mail blocks on my old provider due to exceeding mail sending limitations and similar. This was a clear sign that I needed to change something and Zoho was the right decision. It's been over a year since I'm using their software and it works great. "Excellent service, free up to 50 accounts!" Free for small businesses. Extremely easy to set up. Very reliable. You can't delete users, so if you made a mistake with a users creation you have to live with that record, you can deactivate it but is annoying. Online client could be better, interface is ok, but menu + navigation pane cannot be hidden easily and that eats a lot of space. Go through the documentation and take the time to read the tips so you take full advantage of the platform. Before buying any standalone product consider the Zoho One bundle. Well, email server, I have a free, robust mail service for my domain. It is a service that offers an email experience, it is a clean and fast web mail, it offers a better protection against fake emails, you can also access messages at any time from my mobile or computer. Zoho Mail is straight to the point type of email service. There is everything you need for good workflow organization - email, calendar and notebook. User interface is easy to get into and there are barely if ever times when you feel lost in it. Zoho Mail is nice and easy. You never wander what the heck is going on and you never get lost in the sea of features and pop ups. It does its job as it should and it is all you can ask. Sometimes the thing works way too slow and it might be very irritating. The service might crash once in a while but I haven't experienced it personally. "Unique service with free email hosting"
I've known Zoho Mail for some years now, I was desperate for a free email hosting service for just one email address on my personal domain. I came across Zoho and I really have to congratulate those who created it. It is the only service I know to offer free hosting for users who need to have up to 5 accounts on their domain with 5GB of space! Other services offer free plans but when you send mails they add a small ads at the bottom of the message. Well structured and well manageable. Optimized to perfection to work with all the zoho systems. As for anything else, the service despite many laudable parts, sins in something. Occasionally I have to access the webmail and receive the error "Unable to contact the server" or something similar, I simply solve the page a couple of times, then everything returns to normal. Compared to other mail services, I sometimes find that I am sending and receiving mail too slow, a problem that can be unnerving if you are in a hurry even while you are waiting for some important mail. In conclusion I can only recommend Zoho Mail to anyone looking for a completely FREE solution to better manage their mail services. Zoho Mail allowed me to manage my mail immediately, I waited just the activation time of the domain. Once activated I configured Zoho Mail as indicated by the excellent guide, everything is successful in a short time and I started immediately to send mail. The catchy factor that allowed me to choose Zoho Mail is the fact that it is offered FREE up to 5 users and without annoying ads as proposed by other providers. "Best Kept Secret for New Business / Entreprenuers"
This system packs a serious punch. It simple enough for a plebeian like me to understand how to create aliases, link a custom domain, establish permissions, forwarding rules, and new users. The Zoho branded mobile apps keep you in touch with the core of most business, YOUR EMAIL!, without having a huge IT budget or IT at all. Its not the most recognizable name in the group but I can tell you Zoho has it going on. It gets a bit confusing (kinda like Google) with the screens opening on top of screens and within screens that you forget what layer you are in or what account you are editing under. This caused some inconsistency with settings but it was easily fixed. Definitely intended for small but growing businesses. Don't bite off more than you can chew. Only implement the Apps that you can full get your group around. No cash flow for infrastructure with a new home based business with the necessity to project a professional full- scale presence. Zoho brought multi-level integration to the table. We were able to access project management, customer relationship management, surveys and so much more in a very efficient way. Zoho integrates supremely within itself with external limitation s limited but quickly growing. I've been using Zoho mail for about a year now, and I have to say it's fit my needs perfectly. Out of the box it feels familiar, and intuitive to use, yet they still give you the ability to further refine the ecosystem to your liking. It's this solid base product, with many options to expand that make it a huge draw for me. The very, very rare instance where delivery of my mail might be delayed up to 10 minutes. Unless you require a lot of the other features of Google Apps, Zoho Mail (and their other offerings) should almost certainly fill the needs of most developers with less than 10 employees. A reliable way to manage my email accounts without succumbing to the high costs of hosting with a company like google, or resorting to bloated, and often outdated services such as SquirrelMail et al. Let's not even get started on the headache of trying to manage your own mail servers. Yikes! The best e-mail service I have used thoughout my life time till date. I was a huge fan of GMail for its UX, but I bet Zoho Mail has outperformed. The UX and the UI are just superb with respect to Zoho Mail. Most optimistic feature is that it does not support ads. Zoho Mail is apt for business , with a lot of features that are aimed more at enterprise users than personal email users. Its clean navigation helps you to work faster and easier. I would say, I hardly find any cons with respect to Zoho Mail. Though technically it may have some glitches, which I am not sure about and not the right person to comment.